wwwhatever can integrate an online payments facility with your website. However, there are a number of business decisions you would need to consider beforehand. If you are running and online shop, where you are likely to receive a high volume of transactions, then it would seem that an online payments facility would make sense. If you are letting out your country cottage for only a few weeks of the year, then perhaps an online payment facility is a little over-the-top. Taking payment for an item at the point-of-sale does confirm and should guarantee the sale. However, that sale is not really guaranteed as UK consumer law gives all customers the right to return or cancel their purchase with a full refund within 30 days. On the other hand, allowing a customer to place an order and pay later could mean you get a number of bogus, mistaken and withdrawn sales. So, whichever way you look at it, you will be dealing with refunds or spurious orders. Also, not all customers are happy about providing their banking details over the internet, so you will need to decide who your customers are likely to be and their attitude towards dealing with you. So, an online payment facility is something you need to think about carefully and make sure it fits in with your business philosophy. Whether we are using a WordPress® plugin or a bespoke payment facility, your customer can be sure that their payment details will be safe. 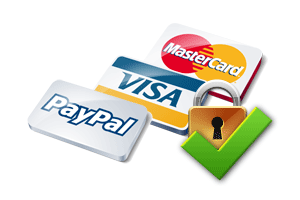 We, and you, will not be able to see or store their payment details as the payment processing will not occur within your website. All payment processing is done from within the bank or payment transaction provider website. All banks and transaction providers supply their own payment API (Application Program Interface) which provides an encrypted and highly controlled access mechanism to their payment facility. The payment details input screen will look as though it is in your website but, behind the scenes, your customer is actually using the bank or transaction provider’s software. What payment providers should you use? You will need to research the costs associated with online payments processing as all banks and transaction providers will charge a fee per transaction. wwwhatever will only provide you with the ability to receive online payments as the business contract is between you and the provider and payment security is the responsibility of your provider, which is in-built to the API and their own software. Your enterprise will have a business bank account. Most customers will have a bank account themselves so you could opt just to link the online payments facility to your bank. But some customer, particularly younger ones, may not have a bank account and would prefer to pay using PayPal™ or some other payment transaction provider, such as Stripe™, Authorize.Net™ Amazon Payments™ and WorldPay™, there are a quite a few to pick from, and you would need to choose which ones are cost-effective and more suitable for you. If you decide not to use a payment facility then you can always obtain payment by providing your business bank account details over the phone or email and asking your customer to pay you using their personal online banking facility. You could ask them to send you a cheque, although this will cause a considerable delay to shipping. You could also accept cash-on-delivery.